Kicker Performance Audio has been around since 1980 and has been producing amazing products since then. Kicker’s drive to consistently produce products that not only are great but also push the standards of the car audio industry is very apparent in all series of their amplifiers. All Kicker amplifiers are CEA-206 Compliant, assuring you are receiving a continuous certified RMS power rating. 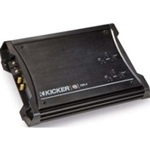 Kicker will always exceed the rated power because Kicker is notorious for under rating their amplifiers. So really you will be getting more power than you actually pay for, which is not true for other lower end performance amplifiers that generally over rate their amplifiers. 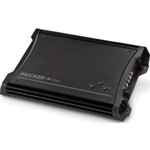 Kicker amplifiers will provide a choice of three automatic turn-on modes; remote, DC offset, or signal sense, which make then compatible with any car audio system. Along with their high-density convection heat sink for extreme heat dissipation and high efficiency MOSFET power supply, Kickers amplifiers are great way to go when selecting the perfect amplifier for your car audio system. Kicker has manufactured a new Fail-Safe Integration (FIT) technology into all of their amplifiers. The FIT technology uses isolated differential inputs in order to reject noise or electrical interferences, caused by engines, alternators or any other audio or video component throughout your vehicle. The differential inputs will use a muting circuit that will block out any additional noise that may stream down the line. The FIT technology will help created the cleanest and purest sound possible for any audio system. The Kicker FIT technology is setting the standard for high quality sound. 4 ohms: 150 watts x 2 chan. Bridged, 4 ohms: 450 watts x 1 chan. Bridged, 4 ohms: 175 watts x 2 chan. Max power output: 350 watts x 2 chan. 8-gauge power and ground leads recommended. 1/0-gauge power and ground leads recommended. T.H.D. + Noise: <0.015% @ 4 ohms. SymbiLink cables allow you to connect ZAPCO audio components and convert a standard unbalanced audio signal into the fully balanced domain usually only reserved for the type of expensive professional equipment found in recording studios or at your local concert venue. With this type of cabling in your component system it virtually becomes immune to electrical interference in the surrounding environment and much less susceptible to signal degradation over long cable runs. It is for this reason that balanced signal cables are common in professional or industrial applications. ZAPCO has made this technology available for your car. ZAPCO engineers also discovered that a significant amount of low frequency distortion was caused by the pulsating DC current in the automobile chassis, and amplifier power wiring. ZAPCO's balanced SymbiLink technology completely eliminates this distortion.